The KAUFMANN CONSULTANT home inspection gives you an independent, unbiased view of any problems and a great deal of insight into solutions, so that you will have all the facts you need to make a sound, informed decision. Depending on the age, size and condition of the home, a thorough home inspection will take no more than three hours, usually between 2 and 2 1/2 hours. Ideally, you will accompany your KAUFMANN CONSULTANT during the home inspection, so that you will have visual reinforcement of your written report. The KAUFMANN CONSULTANT will also make subtle refinements of the report to address any special concerns the client may express. Remember, our reports are custom and unique to your perspective home. We take our inspection reports seriously. 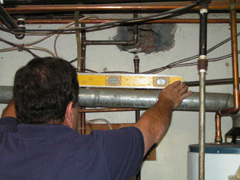 Every inspection is a complete and thorough analysis of all the readily accessible sections of the major systems and components in the home. See "PRELIMINARY INSPECTION REPORT " for details. In addition, you can go to www.NJconsumeraffairs.gov/pels/hilaws.pdf for a more thorough description of areas inspected and areas specifically excluded from a KAUFMANN CONSULTANTS home inspection. The report includes a clear description of any problem areas noted, so you can easily identify them. Digital photographs and engineering diagrams are also used to supplement the report clarity. KAUFMANN CONSULTANT reports are dictated on-site using phrases that you and your attorney can easily understand. We intentionally try to avoid using complex "engineering" or "construction" terminology that only professionals may understand. Our inspectors also provide free telephone and email consultation after your inspection.